Homemade Italian Broccoli Rabe Cavatelli Pasta topped with some Pecorino Romano cheese. Could this possibly be the ultimate Italian comfort food? The same question comes to mind every time I make and eat this dish… how could something so simple taste so amazing? Is it because of the garlic scented olive oil? 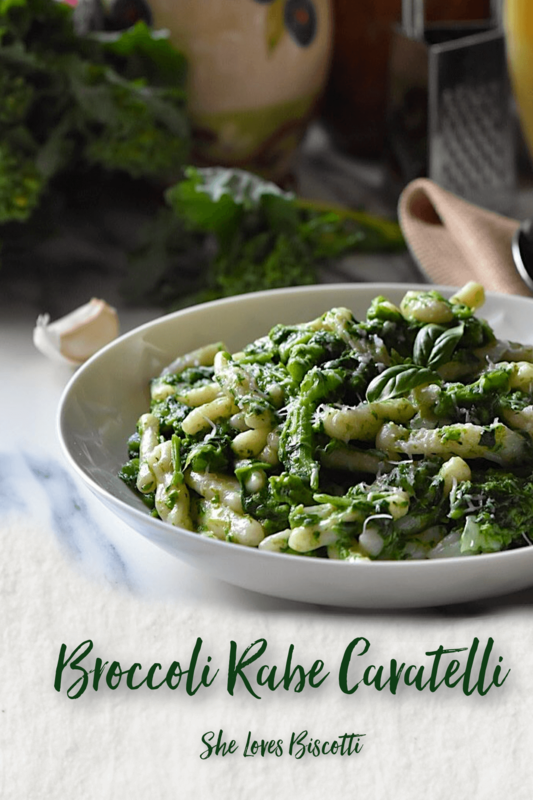 Is it the subtle pungency of the broccoli rabe? Or perhaps the unique texture of the homemade cavatelli? Think about it for a minute. 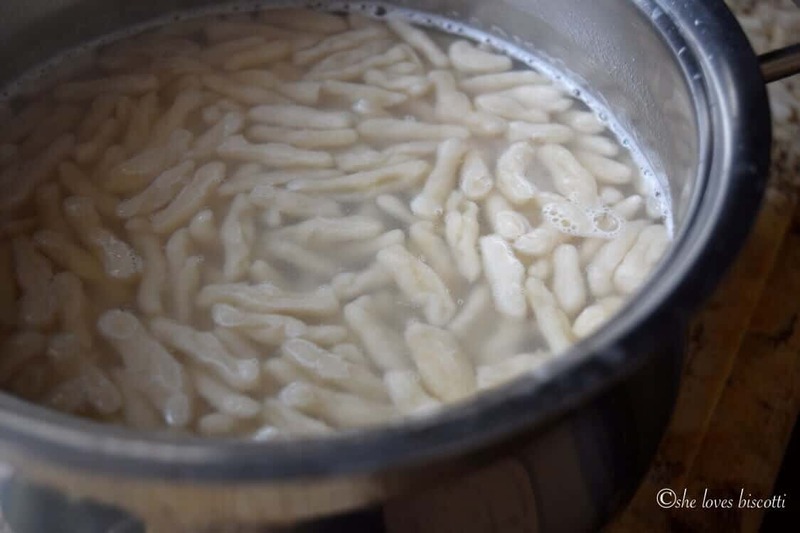 The recipe for homemade cavatelli is the result of combining water and flour. 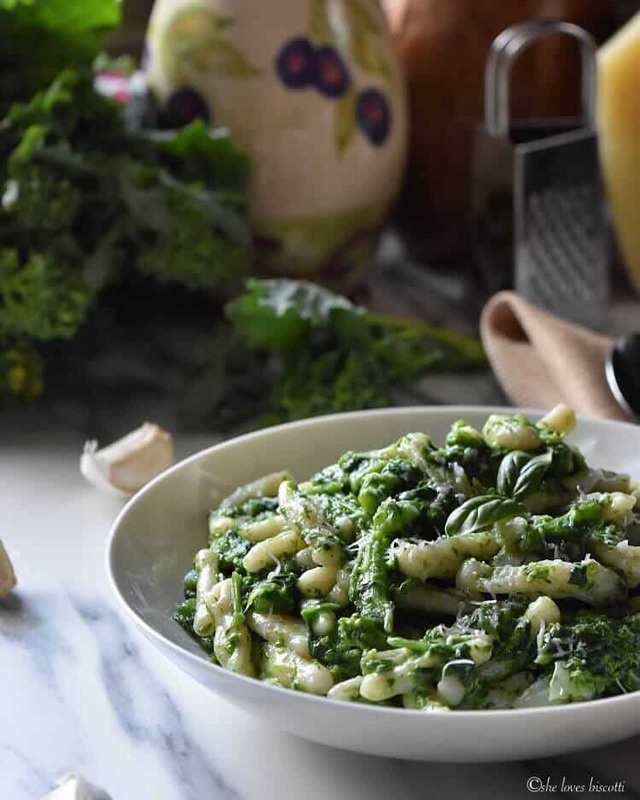 This pasta is then combined with broccoli rabe (also referred to as rapini) which has been sautéed with lots of garlic and pepper flakes. A sprinkle of Pecorino Romano cheese and voilà… the ultimate Italian comfort food in a bowl. Simple, right? This dish is the combination of two recipes that I have previously shared with all of you. The first is this Homemade Cavatelli Pasta Dough Recipe (this post includes a how-to video). My freezer is usually stocked with homemade cavatelli. So, when I want to make a quick week night pasta supper with cavatelli, it’s easy. The second is this recipe for Italian-Style Garlicky Broccoli Rabe. This is a great recipe to have as a side; as a topping for pizza; snuggled in a sandwich or with pasta, but not just any pasta, homemade cavatelli pasta. 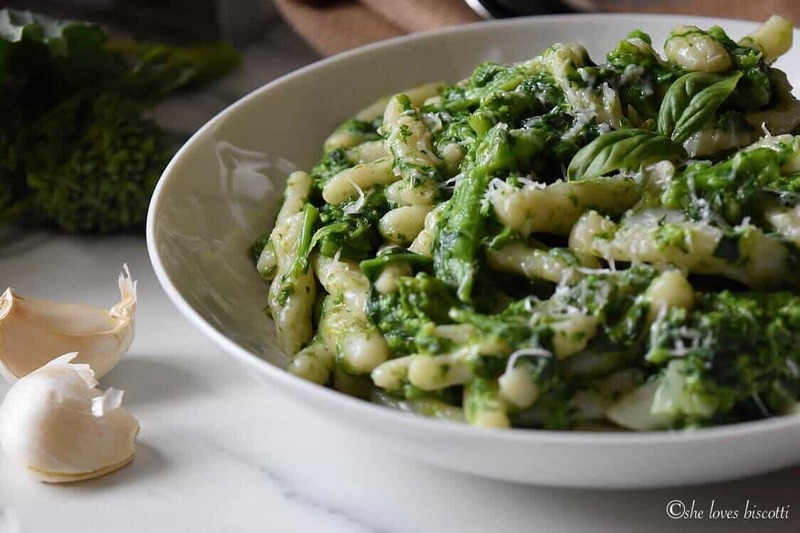 Let me show you how easy this recipe for Homemade Italian Broccoli Rabe Cavatelli Pasta comes together when you start with frozen cavatelli. The first thing you need to do is trim the stems from the broccoli rabe, taking off anywhere from 1-2 inches. The goal being to remove as much of the tough stalk as possible. Then, just like any other vegetable, it needs to be washed. Once that’s done, you need to cook it in a large pot of boiling, salted water until just tender, about 3-4 minutes. With a slotted spoon, remove the broccoli rabe and drain the excess water. I like to use scissors to roughly cut up the broccoli rabe after it has been cooked. If you prefer, a cutting board and a knife is just as effective. The goal is to chop up these stalks. I will now refill my pot with water and bring it to a boil. 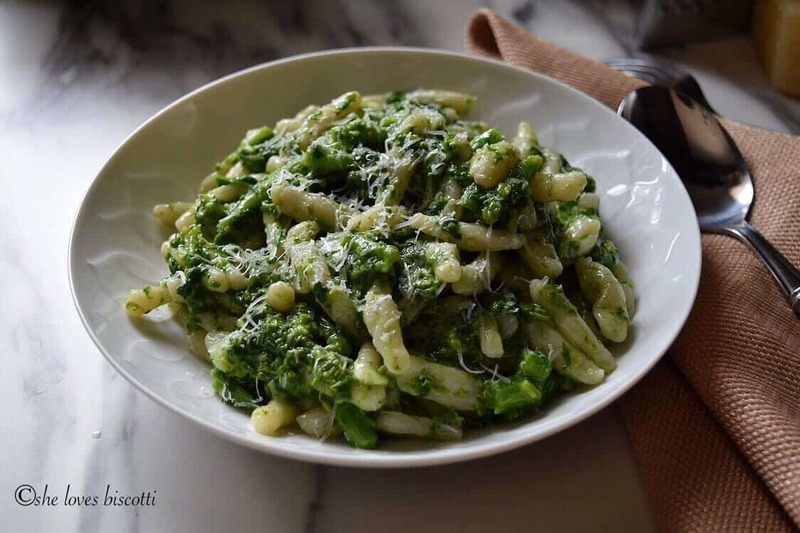 There are some recipes that will instruct you to boil the cavatelli together with the broccoli rabe. Although definitely a faster method, I prefer to boil these two food components apart. In a very large saucepan, heat about 4 – 6 tablespoons of olive oil over medium heat. Add the smashed garlic and sauté for a minute or two. Be mindful not to burn the garlic. At this point, the water should be boiling vigorously. It’s time to add the cavatelli to the water. Although the cavatelli are usually done when they float to the top, taste one to be sure. We are looking for an al dente texture, which simply means it is cooked, but still firm to the bite. Meanwhile, you should begin to smell that sweet garlic scent. Add the chili flakes (to taste) and the broccoli rabe to the sauce pan. Increase the heat to medium high and add about 1/4 cup of the pasta water. Simmer until most of the liquid has evaporated and the broccoli rabe become tender. 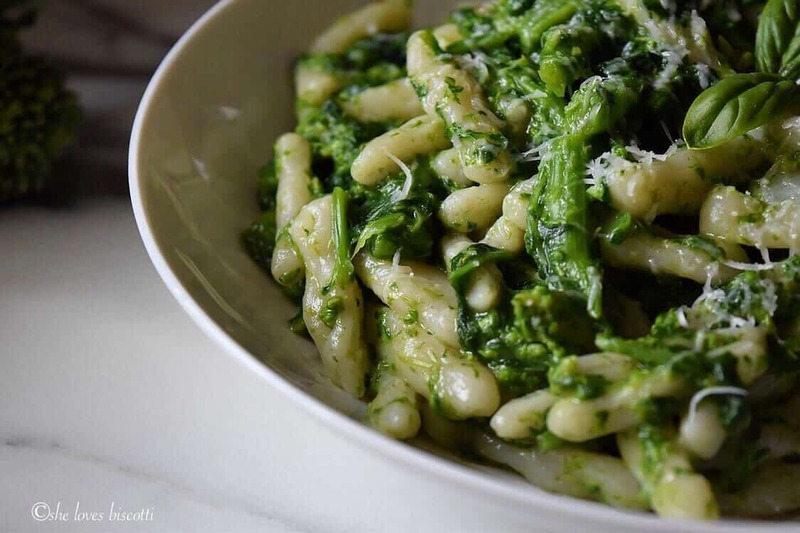 Feel free to add a little more pasta water if the broccoli rabe look a little dry. It is now time to combine these two wonderful ingredients together. Reserve about 1/2 cup of pasta water before draining the cavatelli. 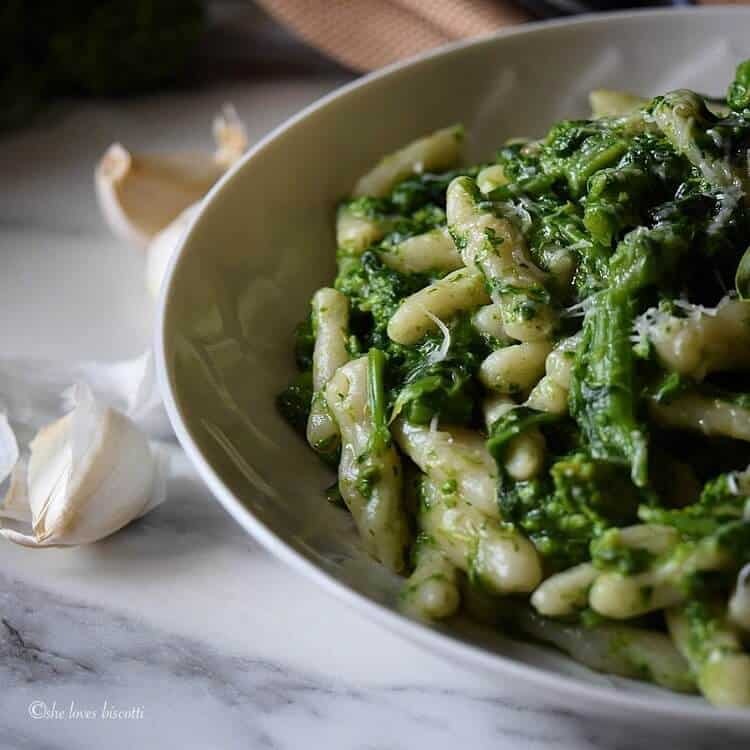 Toss the drained pasta with the broccoli rabe in the saucepan. Once again, if the dish looks a little dry, feel free to add some reserved pasta water. Pour pasta into serving bowl and drizzle with some extra virgin olive oil. A sprinkle of Pecorino Romano cheese and your done! 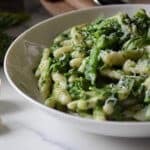 This Homemade Italian Broccoli Rabe Cavatelli Pasta is a simple and delicious recipe prepared with just a few basic ingredients. This is the essence of so many of the dishes that I grew up with. I have previously mentioned that my paternal family was originally from Ripabottoni, in the province of Campobasso, in the Italian region of Molise. Traditionally, this area was known for sheep and agricultural farming (done on small plots of land). The ingredients used in so many regional Italian recipes is the direct result of the surrounding environment and economics of the area. My dad’s family were farmers in this area for centuries and the influence can easily be seen in the simplicity of so many of the dishes. My dad would love to tell us stories of his childhood. Somehow, they would often revolve around him losing sheep and big bowls of cavatelli. My mom would always make cavatelli on Father’s Day as this was one of my dad’s favorite dishes. 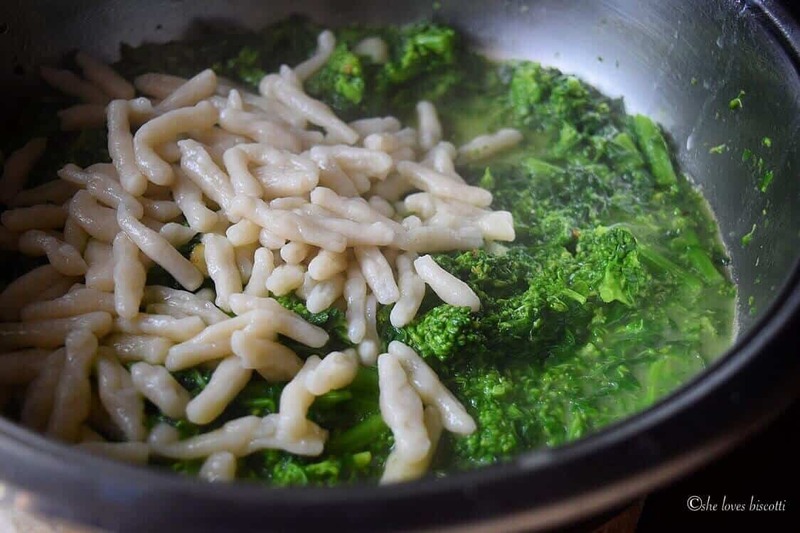 Sometimes it was this recipe for Cavatelli with Tomato Ricotta Sauce and other times it would be this simple recipe for cavatelli e rapini. 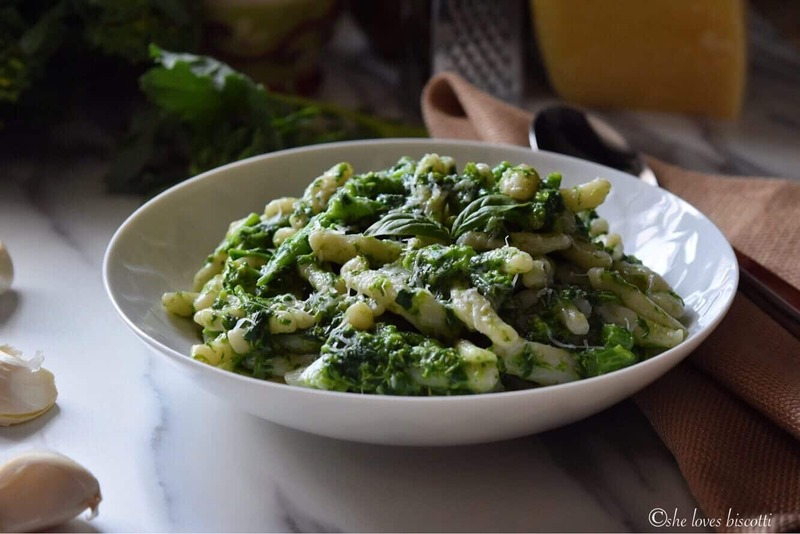 This week-end, we will be celebrating Father’s day and I will be making this recipe for Homemade Italian Broccoli Rabe Cavatelli Pasta. We will continue to talk about all of the wonderful stories my dad so lovingly and proudly shared with all of us. Trim the stems of the broccoli rabe, anywhere from 1-2 inches. Add the broccoli rabe and cook until tender. This should take 4-5 minutes. 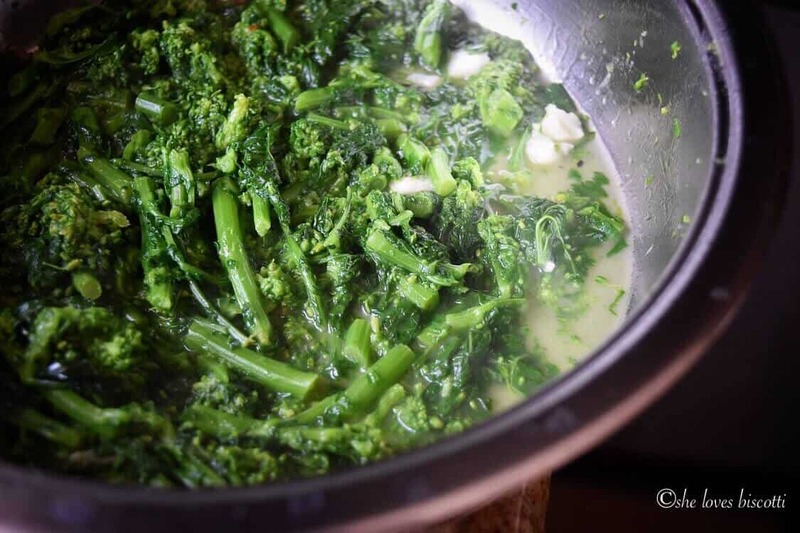 Drain broccoli rabe in a sieve. Gently squeeze out excess moisture. 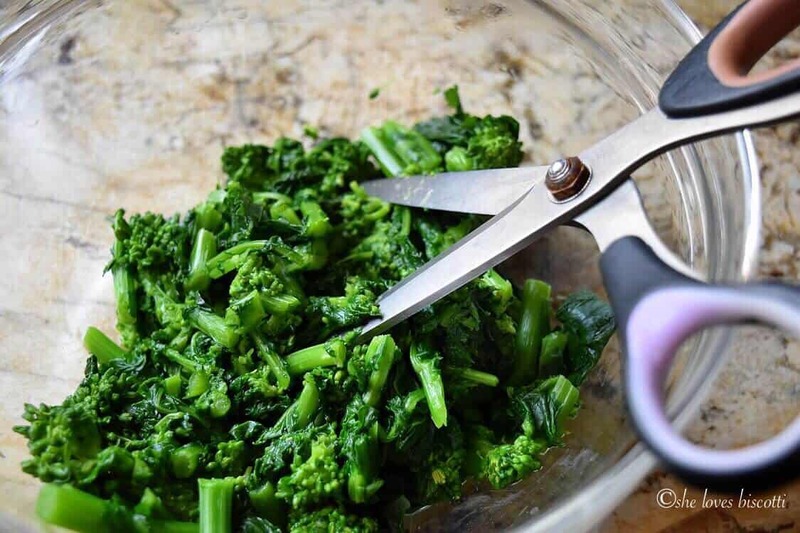 Use scissors to roughly cut up the broccoli rabe. Set aside. Bring large pot of salted water to a rolling boil. Please note that you can use the same water used to cook the broccoli rabe. My personnel preference is to start with a fresh pot of water. While waiting for the water to boil, drizzle olive oil in a large skillet over medium heat. 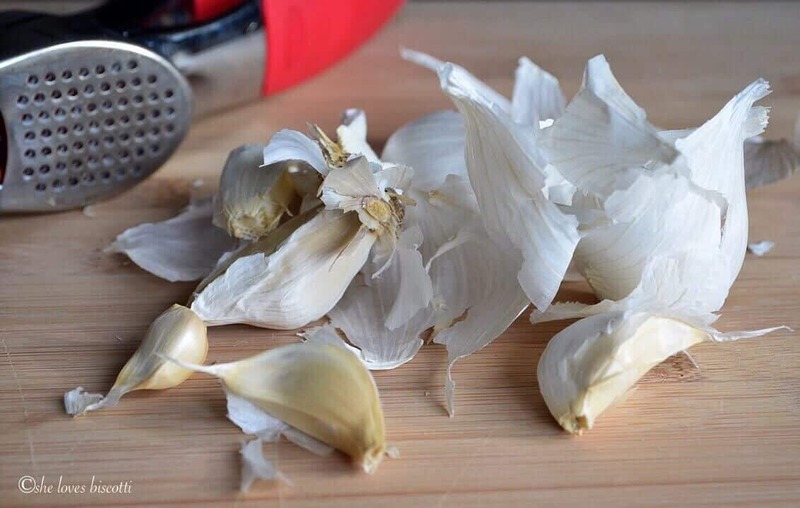 Sauté smashed garlic for 1 to 2 minutes. Add the chili flakes (to taste) and the broccoli rabe to the sauce pan and sauté for a few minutes. Add the cavatelli to the salted boiling water. Homemade cavatelli take only a few minutes to cook. When they float to the top, they are done. Meanwhile, increase the heat (of the broccoli rabe) to medium high and add about 1/4 cup of the pasta water. Simmer until most of the liquid has evaporated and the broccoli rabe becomes tender. Feel free to add a little more pasta water if the broccoli rabe look a little dry. Drain the cavatelli (reserve some pasta water). Toss together with the broccoli rabe (add some reserved pasta water if dish looks a bit dry). Place on serving dish and drizzle with olive oil. Sprinkle with Pecorino cheese and garnish with fresh basil leaves. Yes, for me that’s the ultimate comfort food! It makes me feel so good inside when I eat a plate of pasta like this, simple, super tasty and nutritious. I still have to make cavatelli, my mother makes good ones, but she calls them strozzapreti 😄. Good tip on the scissors, I find I use my kitchen scissors a lot as well for things like this, highly underrated tool. Such a great comforting dish! It looks just amazing in your beautiful pictures. Love the use of broccoli rabe!! A classic which is without a doubt Italian comfort food at it’s finest. You have presented the instructions with such clarity that it can be easily duplicated. Often times those dishes from our childhood are the most difficult to put into recipe form. Brava!